The Tennessee rental contracts are written for the mutual agreement between an owner/manager of property, the ‘Landlord’, and an individual or entity seeking to rent the space, the ‘Tenant’, for a period of time. All legal documents must be created in accordance with Title 66, Chapter 28 (Uniform Residential Landlord and Tenant Act). Rental Application – Verification method used by landlords to make sure the tenant is employed and able to afford the monthly rent. Association of Realtors – For standard tenancies in a single-family dwelling. Commercial Lease Agreement – For business or professional use which space can be defined mostly as office, retail, or industrial related. Farm Lease Agreement – For a structure and/or land used for the growing and nurturing of crops. Lease with Option to Purchase Agreement – Residential contract that allows a landlord-tenant arrangement with the added choice of the lessee being able to buy the property. 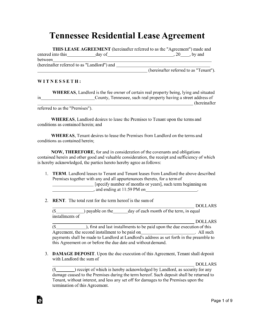 Month to Month Lease Agreement (§ 66-28-512) – Known also as a tenancy at will that allows the landlord or tenant to cancel the arrangement with at least thirty (30) days’ notice. Room Rental (Roommate) Agreement – When the individuals living in the same home agree to the cleaning of common areas and expenses, fees, and utilities to be paid in relation to the residence. Standard Residential Lease Agreement – For a residence with a specified start and end date for the term. Sublease Agreement – The act of a tenant electing someone else to use residential space they have under agreement with the landlord/manager. If required, the landlord will have to grant their consent before authorizing. 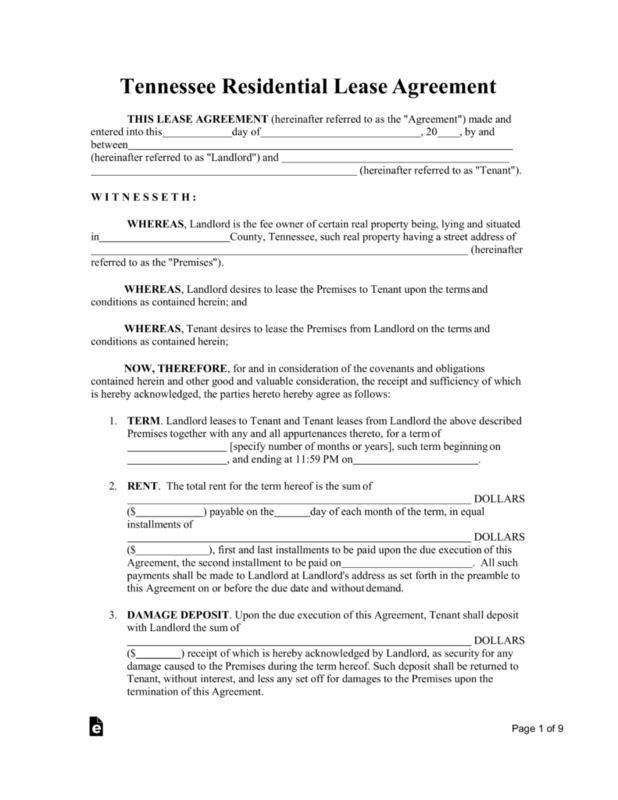 Termination Lease Letter – Allows for either the landlord or tenant to cancel a month to month arrangement with the State required thirty (30) days’ notice. Agent/Landlord Identification (§ 66-28-302) – Landlord or agent allowed onto the premises must be recognized in the lease agreement. In addition, an official address for legal notices must be in the rental contract as well. Showings (§ 66-28-403) – If the landlord would like to show to prospective tenants the property before the lessee’s agreement is due it must be stated that the landlord has this right with the last thirty (30) days before the termination date. The landlord must grant at least twenty-four (24) hours per occasion. There is no law that states the landlord must give notice to the tenant for non-emergency reasons. Although, if it is in the last thirty (30) days of the rental contract and the landlord would like to show the space to a prospective lessee the landlord must provide at least twenty-four (24) hours notice (§ 66-28-403). Maximum – There is no Statute requiring the landlord to adhere to a cap. Returning (§ 66-28-301) – Funds must be delivered to the tenant within thirty (30) days after they have vacated the premises.